The element's title can be edited here. A maximum of 255 characters is permitted. A escription for the user-defined element can be specified here. A maximum of 255 characters is permitted. Based on the keywords entered here, the user-defined element can be found using the search field in the Elements area. Each keyword must be separated by a comma. 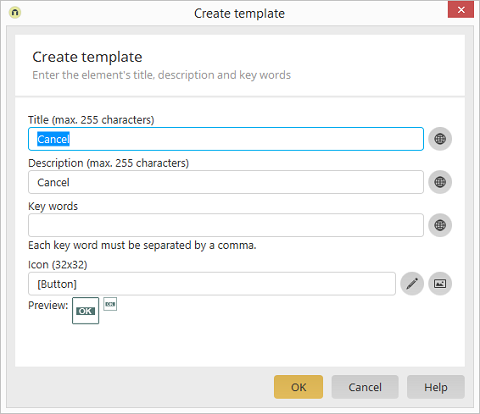 In each case, opens a dialog where the title, description or keywords can be entered in multiple languages. Displays the path and filename of the selected image. Opens the normal dialog where an image with the dimensions 32 x 32 px can be selected as an icon for the new, user-defined element; this icon will be displayed in the Elements area. Opens a dialog where an icon from the Intrexx standard icons can be selected. User-defined elements will be saved as a template in the client directory.